The Destiny 2 Arms Dealer Strike is mostly about taking the fight back to the Cabal in Destiny 2, as your Fireteam boards a Cabal ship in an attempt to hunt down Bracus Zahn, said to be responsible for multiple atrocities across the galaxy. In this Destiny 2 Arms Dealer Strike guide, we'll be walking you through the entire Strike, right until your climactic showdown with Bracus Zahn himself at the end. 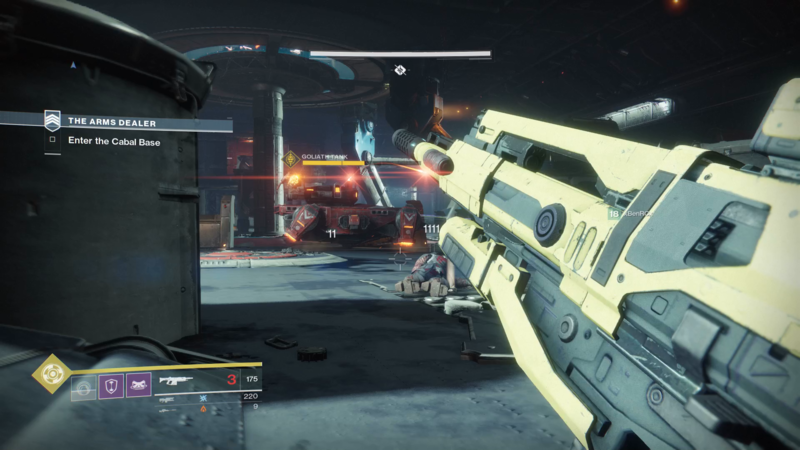 For all things Destiny 2-related here at USgamer, head over to our Destiny 2 guides walkthrough hub, where you can be sure to find walkthrough guides for every other Strike in the game, as well as comprehensive breakdown of everything we know about Destiny 2's first Raid, called Raid 5. If you'd rather watch a video walkthrough, we've got a full playthrough of the Destiny 2 Arms Dealer Strike for you in this video guide. At the very beginning of the Destiny 2 Arms Dealer Strike, you'll find yourself already among Cabal forces, with a few Psions, Legionaries, and Incendiors being just a few metres from you. Take them all out, and head down the corridor to activate the computer console, which will open up a door to the left of you. Now you'll find yourself outside, with a whole host of Cabal forces in your way. There are Psions, Legionaries, Incendiors, Honored Legionaries, and other enemies, so stick with your Fireteam and push forward, since although there are many enemies, none of them pack a serious punch. Offload the charge where prompted, and then turn right, dropping down off the platform onto a walkway where a few War Beasts will rush you. Kill the War Beasts, plus the troops that drop into the battlefield above the walkway, and make your way to higher ground. There are a lot of War Beasts waiting for you up here, as well as a Centurion, so take them all out quickly and offload the second charge to the right. There will then be a couple of tough enemies that spawn to the right of you, standing in the way of you and the Lieutenant you're meant to defeat. Take them all out, making sure to utilise cover and Super Abilities whenever you need them, and head inside. 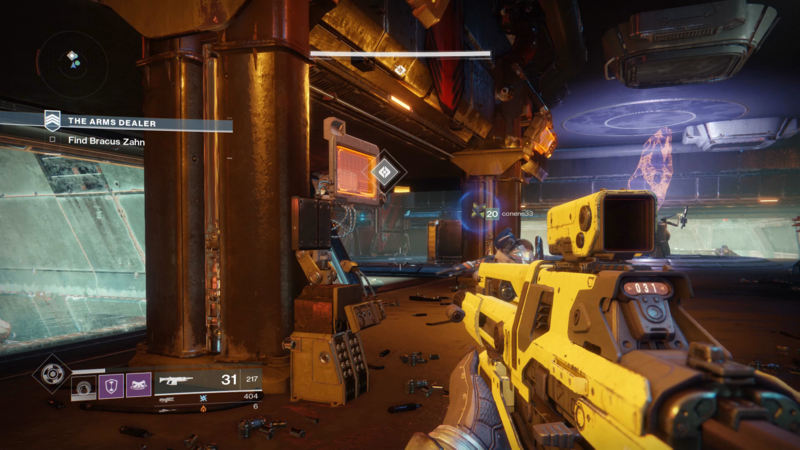 Proceed down the corridor inside the building, and you'll come across a few Psions and Legionaries, which shouldn't pose a challenge to your Fireteam. You'll then come to an outdoors area, where Cabal and Fallen are fighting among one another. There are two gunships hovering overhead, but if you damage them enough, they usually fly away from the battlefield. 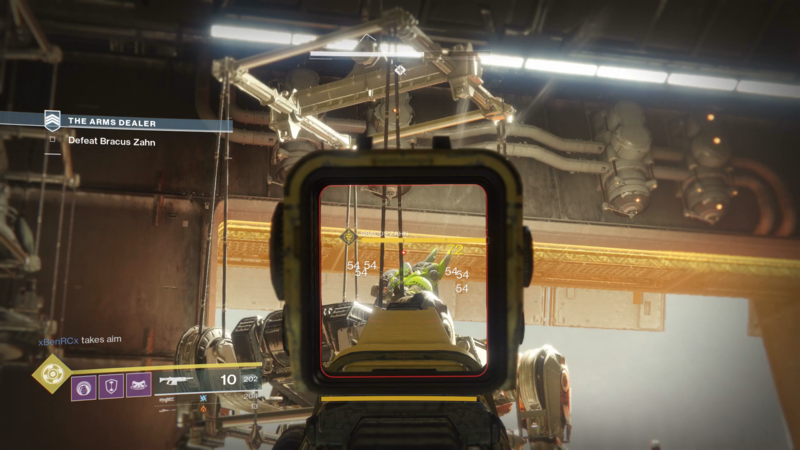 You can either let the Fallen and Cabal fight it out, or gun both factions down, but either way, you'll have to take out a powerful Sniper and Colossus before you can proceed. Head inside the ship itself, where you'll have to prepare for one hell of a fight against all the firepower that the Cabal can muster. Inside the ship itself, you'll face off against a Goliath Tank, Legionaries, Incendiors, and Psions, all of which need to be taken down as quickly as possible. We'd recommend focusing on the troops at first, effectively hiding from the tank before turning your attention to it. Spread out across the battlefield, so the tank can't damage all of you at once, and you should be fine. After this fight is over, you'll have to activate two computer consoles, before lowering a platform down from the ceiling. Surprise! There's another Goliath Tank waiting for you on the platform, on top of Incendiors, Phalanxes, and other Cabal troops. Shield yourself from the tank behind cover, and utilise all the explosives you can to take out the tank. Head through the door that the platform leads to, and you'll be swarmed by War Beasts. Head through a long, winding corridor, and it's time to face off against Bracus Zahn, the arms dealer himself. As soon as you enter the room with Bracus Zahn, aim up and focus your firepower on the boss, before he uses his jetpacks to get away. 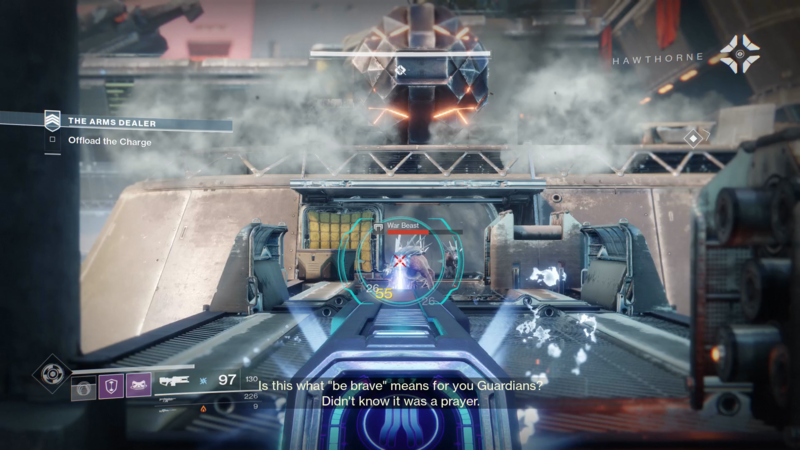 There will now be several Cabal turrets, Legionaries, Psions, and other troops between you and the boss, so it's best to take out the turrets first, and then focus on the ground troops, before the boss himself. You'll eventually push Bracus Zahn back far enough that he'll vanish, and you'll have to climb on a lift in order to bring yourself up to his level. Aim up while you're on the lift, and you can get a few shots in on Bracus Zahn before he summons in support to the arena. Once you're up on the same level as the boss, you'll find yourself in an outdoor arena, which itself is pretty large. Zahn will now summon a horde of enemies to help him, so it's best to have one person distract the boss, and the other two members of the Fireteam to concentrate on the ground troops, as they can become especially difficult to take down if you leave them for too long. At several points in the fight, Zahn will retreat to a high column, and the only way you'll be able to take down his shield is to grab a ball of energy from the end of the battlefield, and place it in the slot near his column. Do this quickly, as Zahn can become a real headache if you leave him shielded for too long. Other than the above tactics, there isn't much else to the Bracus Zahn boss fight. You'll just have to make sure you're focusing on the right enemies throughout the fight, but also never leaving Zahn free for too long. Your fight with Bracus Zahn aka. the Arms Dealer might be done here, but there are still five other Strikes to take on. Head over to our Destiny 2 Strikes guide hub if you want help on how to tackle all of them. We've also got guides on how to get the Rat King in Destiny 2 and how to complete the Destiny 2 Leviathan Raid.